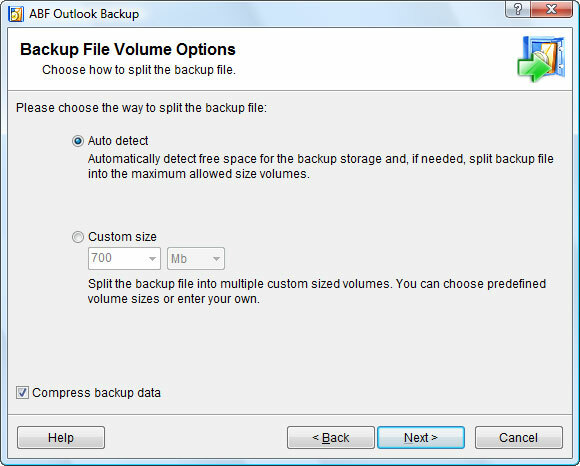 This step lets you to define whether to split or not the backup file. This feature is useful when the backup file is too large and needs to be placed to several storages. Figure 12. Backup file volume options. Auto detect volume size - use this option to let ABF Outlook Backup to detect free space on a chosen storage for the backup file. After free space detection and only if needed the program will split the backup file into the maximum allowed size volumes. Custom size - choose this option to define custom volume size for the backup file. Then select one from predefined volume sizes or type your own. Compress backup data - check this check-box to compress the backup data. This will decrease the size of backup file. By default, when you are performing backup without configuring Advanced backup settings, program will detect volume size automatically and will compress the backup data.